Chhaang is the refreshingly tart, lightly-alcoholic drink popular in Tibet and Nepal. 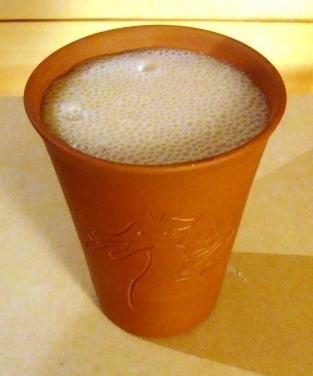 It seems to be a close relative of rice wine, although it can be made from rice, millet or barley, whatever’s handy. As I understand it, Tibetan chhaang is usually made from rice, and Nepali chhaang from millet. In the “whatever’s handy” spirit I used rice, millet, barley and wheat. The fermenting agent in the Himalayas is a mysterious ingredient known in English as “yeast balls.” Evidently these are highly revered, and perhaps passed down in the family, though they are said to be available in ethnic grocery stores. I tried to find a source for them through the internet, and a Chinese variety is now manufactured by Toronto’s Onto Yeast Company. A bag sufficient for 10 liters of rice wine—if my simplified Chinese translation can be trusted—costs about $10. Sous Chef also sells a smaller bag online at considerably less cost, depending on where they ship to. According to my research, Himalayan yeast balls are made with local ginger, grain flour, and water. The ginger is said to have the necessary organisms residing on it’s skin–yeast and Aspergillus oryzae . This fungus is able to convert the starches in grains into sugars without the need to sprout or malt them, and is used to ferment soy beans for tamari, and rice for sake. I tried mixing shredded store-bought organic ginger with barley flour and water, formed this into cakes and proofed them for 3 days under a damp cloth. I got a smelly mess. I guess the ginger just isn’t the same. Probably too clean for one thing. So instead I steamed some rice, added koji-kin, and made myself a moto starter as I would for sake. I mixed mold-coated rice with Windsor Ale yeast, known for its estery, fruity contribution to a brew. After three days this starter was nicely soupy, and so I added a culture of two strains of lactobacillus bacteria and let it ferment for another day. The main mash consisted of malted barley, to which was added pearl barley, millet, rice and dark wheat, all of which had been boiled for 20 minutes in a ginger-root tea. This was mashed for two hours and cooled to room temperature. The moto starter went into the mash soup with all the grains, and fermented for three days. Traditionally, the mash would at this point be placed in a bowl or mug, warm water poured over, and the drink sipped through a bamboo straining straw. More water would go in until the drink was too weak to continue. Because I wanted to keep the chhaang for a while, I strained it, bottled it, and kept these bottles refrigerated. At this time the chhaang has been aging cold for about 2 years. Aged Chhaang is a dark creamy color, opaque and has a nice layer of bubbles on the surface. The moto/koji/sake aroma is very prominent. It is very slightly sweet, with a mostly tart flavor. Sugar may be added to taste. Full-bodied and lightly carbonated, it finishes with a mouthwatering tang. I don’t know what Nepalese chhaang tastes like, but this one is certainly an interesting and mildly inebriating beverage. I would be proud to serve it to a visiting yeti. This entry was posted in Uncategorized and tagged ale, barley malt, beer, chhaang recipe, fermentation, ginger ale, homebrewing, irish ale yeast, sake, umami.